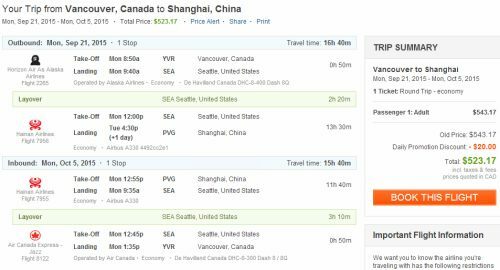 Some third party websites are showing flights from Vancouver to Shanghai, China for as low as $523 CAD roundtrip including taxes, using a combination of Air Canada or Alaska Airlines and Hainan Airlines. 2. Click through from Kayak to the third party websites of Travelgenio or Travel2Be (same company) for booking. Note that these third party websites are ranked #14 on my list of trusted third party booking sites. This is about where one starts to get into the lower quality tier of booking sites. Some of these flights may also be bookable through FlightHub.com for slightly less, at $523 CAD roundtrip including taxes. The following AirBNB link will lead you to some great deals on places to stay in Shanghai for under $70 CAD per night for 2 guests. vancouver, yvr, flight deals, alaska airlines, air canada, asia, china, shanghai, pvg, eastern asia and hainan airlines. No Responses to "Vancouver to Shanghai, China - $523 to $553 CAD roundtrip including taxes"